Homemade soup is so much better than canned. This one is easy. It makes a big pot, so you can freeze the extra for another meal. I’ve got leftovers of this going into the crockpot for our dinner tonight. Cooking once and eating twice is always nice! I modified this recipe a bit from the way my mom gave it to me. I thought the modified version tasted better, but I’ll give you the original ingredient list too. Brown the hamburger, onion and green pepper together. Drain and rinse under hot water to remove the grease. Put back in a large soup pot and add all the other ingredients. Bring it to a boil and let it cook a few minutes or simmer it for a few hours. I served it with Cheddar Muffins. 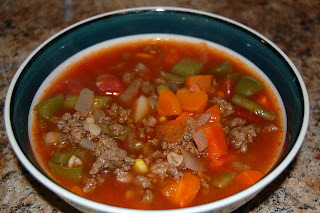 If you have an Instant Pot, then you’ll want to check out my Instant Pot Hamburger Vegetable Soup version of this favorite. And the entire collection of The Best Easy Instant Pot Soup Recipes. And if you want more quick and hearty recipes for the Instant Pot, then sign up for my free Instant Pot School. You’ll learn how to make some basics, soups and way beyond with free printable recipes, a meal plan with a color-coded grocery list and video lessons. Thanks for stopping by my place. I’m going to poke around yours for a while. I make a similar soup quite often and it is so yummy. I am going to try your recipe. Thanks for posting it. MMMMM…I love these easy soups- and you’re right, so much better than the canned variety! Umm now I am liking your soup Tiffany. I love hamburger soup so this will make me happy. This sounds so good – I love soups like this, they’re basically an entire meal in one pot! I love some of the recipes I am seeing and am going to forward your blog to a few friends! Thanks for the easy culinary inspirations! That’s a nice soup.. Looks heallthy n filling too. U have a nice blog here..
oh big big super yum my hubz will love this!! i also want to invite you to follow my blog (if you aren’t already following). every month i will do a drawing for fun prizes from my list of followers. you don’t even need to stop by everyday (though i would so love that) just follow…cool right?! Oh delish!! That looks lovely! Tiffany, this sounds like a tasty recipe…I wonder if it would work with the fake ground beef (“Yves if you please” is the brand) that I’ve been using lately. 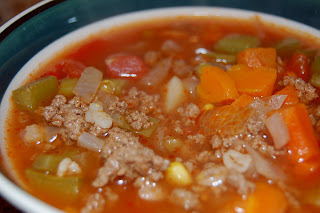 Chili comes out well with the fake meat, so I imagine this soup might work. Soup sounds so good right now. Mmmmmmmmm. And cheese muffins? Yummy! Thanks for visiting my site the other day when I was featured on SITS. So glad to have found your blog!!!! Great recipes!!! I was just stopping by fro SITS 🙂 Have a super rest of your weekend! I just love a good bowl of soup and can eat it every night. 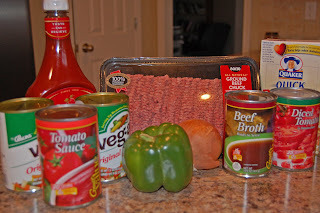 I am not however, a good beef soup maker so I will definitl try this but will not use canned veggies I am not a fan of them. I ill substitute frozen instead. I really liked this recipe because it was so easy and had everyday ingredients, nothing exotic that you would have to run out & get. I did have to modify it though because I only had 2 lbs. of hamburger and frozen mixed vegetables. So I put in 3 cups instead of the Veg-all. Also, because I’m getting older I seem to be losing some of my sense of taste so I “doctored” the recipe a little for our taste buds. I added a little seasoned salt, a Tbsp. wooster sauce, dash of cayenne, 1-2 drops hot sauce, a little garlic powder and some parsley flakes. I was too lazy to make your muffins so just did sweetened corn muffins. Everybody was happy! Thanks for the recipe. Quick question, is the rice in the above mentioned recipe cooked or uncooked? Thanks!! Hi i was wondering can this be adapted for the crockpot? Jennifer, this would work perfectly in the crockpot. Just have the meat browned already. I like keeping browned out hamburger in the freezer for things like this. Great idea. If it makes more than will fit in your slow cooker, freeze the extra for another meal.